Diabetes has become an epidemic in the recent years with over 400 million people affected worldwide. Diabetes is a physical condition wherein the body is unable to process the carbohydrates completely. The autoimmune process destroys the insulin-producing beta cells in the pancreas in type 1 diabetes. The diabetics need to inject insulin during the day to make sure glucose levels are maintained in the body. Naturally one of the ways to achieve better blood sugar levels is by following a low-carb diet. Coming to what amount of carbohydrates is ideal for the diabetics is a debatable topic. As per studies conducted, keeping in mind blood sugar levels, weight and other diabetes parameters, the carb when restricted to 20 grams per day is shown to give good results. The right amount of carb is again dependent on the individual as the response varies. With blood glucose measurement before and after the meal you get a fair idea for intake of carbs. Instead of completely giving up on carbs, a balanced platter of high-fiber with right nutrients with low carbs like vegetables, berries, nuts,and seeds should work fine for daily meals. Before going to recipes let’s take a look at what foods would suit best? Anything grown and untouched and processed by human hands can be had. Olive oil & coconut oil. 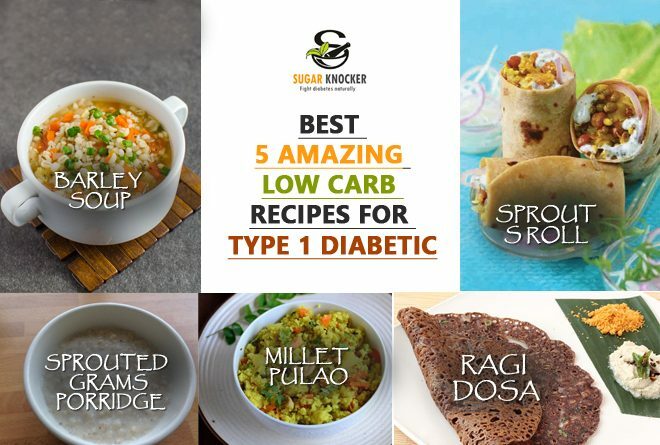 Diet high in carbohydrates can raise the blood sugar levels in diabetics. Here fresh rolls are ready to pack for lunch. In a mixing bowl, add 1 cup ragi flour, 1 cup Rava, ½ cup rice flour. Add ½ cup curd, 1-inch ginger, 1 green chili, few curry leaves, chopped coriander, 1 onion, 1 tsp cumin, ½ tsp pepper, and 1 tsp salt. Rest the batter for 15-20 minutes. Sprinkle ½ or 1 tsp of oil on tawa. As the dosa roasts to a golden brown, turn it over and cook. Finally, fold the dosa and serve instant ragi dosa with mint chutney. You can either make it at home or go for a ready-made available from Manna. A mix which contains the powder of various sprouted grains. Note: Instead of milk you can use buttermilk also,but this does not involve boiling. This can make a healthy and quick breakfast option to suit you. Wash and soak barley fora few hours. In a pressure cooker, pour 1 tbsp oil. After a fewseconds and add jeera/cumin and let it splutter. Add grated ginger and garlic. Saute till the raw aroma is gone and add carrots and barley. After a few minutes add tomato puree to it. Let it cook until tomato is cooked. Add salt, red chili powder, paprika and mix well. Add water and cook until the barley pearls are soft. After opening the pressure cooker, let it simmer for additional few minutes. Sprinkle cumin powder and check salt at this time. Garnish it with cilantro. So here you are with hot soup on a rainy day. Just right for your taste buds and friendly to your body too. All our body types are different and unique. Knowing how our body responds to food with little trial and error, we certainly can make the right choices and make peace with ourselves. Choose Ayurveda along with your regular food. Sugar Knocker brings you the most natural products that are completely herbal and you can place your trust upon. We do NOT challenge conventional medicine but provide supplements that help diabetics to manage their condition better with the use of natural and time-tested ingredients. The all natural Sugar Knocker works along with your prescribed drugs without any side effects and will become an excellent addition to your diabetes management regimen. Sugar Knocker not only focuses on controlling sugar level but also starts working on a root cause of diabetes. In short it gives permanent solution by removing problem from root and not temporary by controlling sugar level. What is Your Reaction for this article? Next How Healthy Fats Affect Youths with Diabetes?